Thank you to all our Bay Parade participants & supporters! 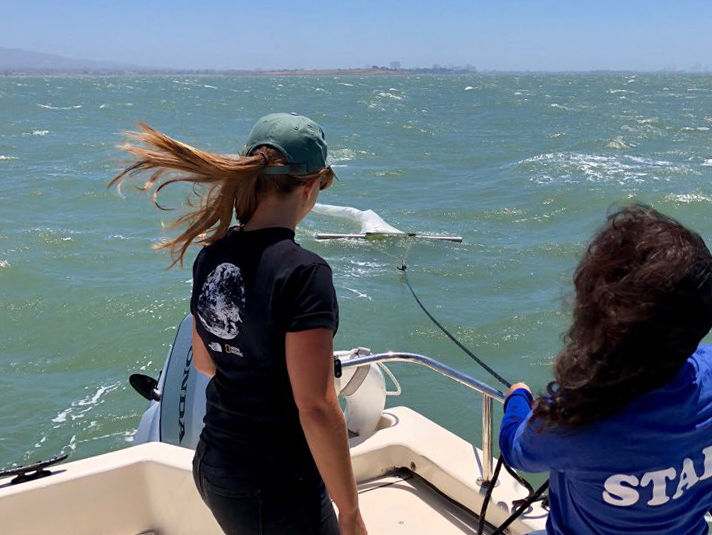 Baykeeper recently hosted two National Geographic researchers aboard the Baykeeper boat to collect samples of plastic pollution in San Francisco Bay. For two days we sampled throughout the Bay, using a trawl (pictured above) to pull plastic out of the water. The pieces ranged in size from large plastic chunks to tiny microplastic particles. The data from the samples will be compiled for National Geographic's multi-year Planet or Plastic? initiative. The initiative aims to document and reduce the amount of single-use plastic that enters the world's oceans. Researchers are especially interested in studying how plastics in San Francisco Bay absorb toxins that may be passed to animals that consume plastic in the water. Results of the research conducted with Baykeeper will be used to provide science-based solutions to reduce plastic in the Bay and ocean. Learn more about National Geographic and Baykeeper investigating plastic in SF Bay. Baykeeper is fighting for more water in the rivers of the Sacramento-San Joaquin Delta, which provide critical fresh water for fish and for San Francisco Bay. Too much water in the Delta is diverted for use by farms and cities. 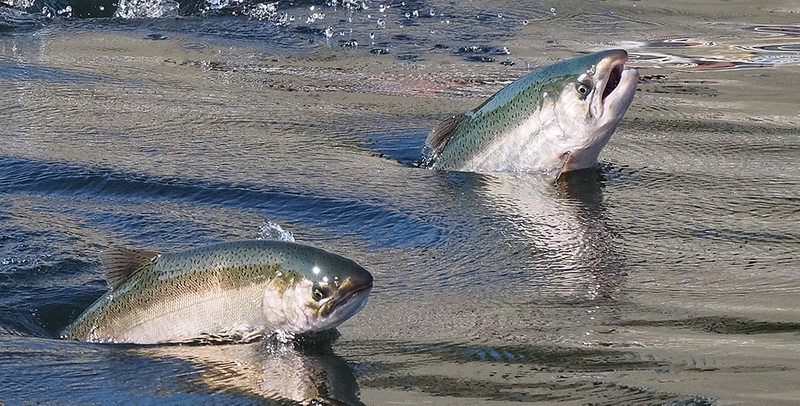 That's resulted in major declines in salmon and smelt populations, and not enough fresh water for the Bay's delicate ecosystem. This month, regulators are expected to adopt a plan that could increase fresh water flowing into the Bay and Delta. But the plan doesn't go far enough. Baykeeper is advocating that regulators provide what scientific experts say the Bay and Delta actually need: to restore 50-60% of the entire San Joaquin River basin's natural winter-spring runoff. This plan would require limits on the amount of water available to Bay Area cities. But with improved water conservation and efficiency, these limits are well within reach. A thriving Bay-Delta ecosystem is an achievable goal—and that's what Baykeeper will continue to fight for. Learn more about the importance of fresh water flows in the Bay. 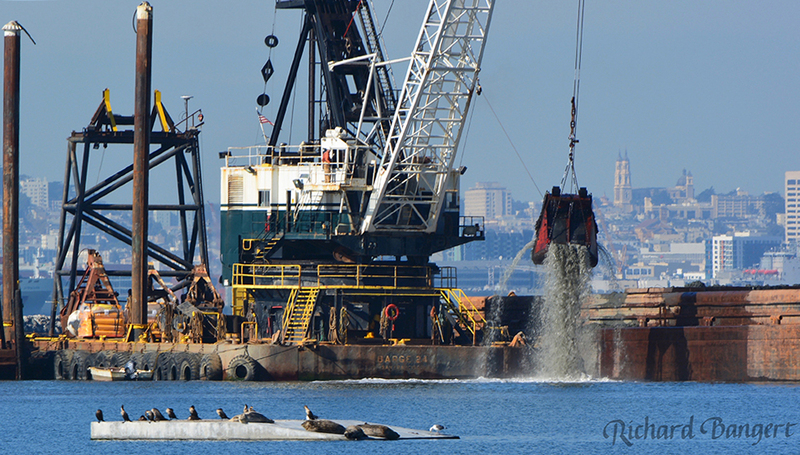 Dredging in the Bay clears channels to keep ships from getting stuck in shallow waters. But some of this dredging hurts fish. Baykeeper is working to protect Bay fish from bad dredging practices. The U.S. Army Corps of Engineers uses suction dredging in sensitive habitat areas that vacuums up everything on the Bay floor. This kills large numbers of Bay fish, including Delta and longfin smelt, both of which are on the brink of extinction. "There's no need to kill wildlife to create safe shipping channels," says Baykeeper Managing Attorney Erica Maharg. "Plenty of dredging operations use equipment that's more protective of fish. The Army Corps should use those safer tools whenever possible, too." Baykeeper has an active lawsuit to compel improvements in Bay dredging practices. We'll continue to stand up in court to protect fish and other wildlife in San Francisco Bay. Read more about Baykeeper's work to stop harmful dredging practices. 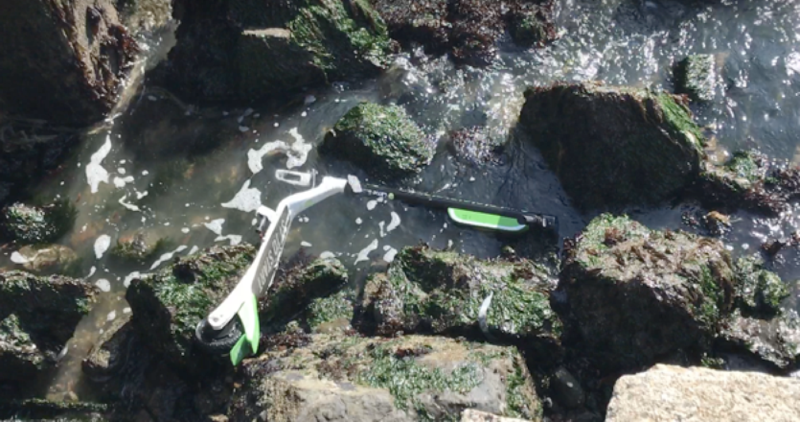 Baykeeper's pollution hotline recently received a tip that Lime scooters had been dumped in the Bay and left to decay. We investigated and discovered that a number of other app-based scooters and bikes for hire have been dumped in local waterways. So Baykeeper worked with Lime, one of the largest bike and scooter sharing companies in the Bay Area, to improve the response to their equipment being tossed in the Bay. The company agreed to adjust their Bay Area operations to retrieve all scooters and bikes from waterways within 24 hours of receiving a report of dumped equipment. We're advocating for the company to take additional steps to prevent and respond to dumped bikes and scooters in the Bay. If you see a scooter or bike in a local waterway, please report it to its parent company. If they do not respond in a timely manner, contact Baykeeper's pollution hotline. Read more about Baykeeper's advocacy to keep scooters out of the Bay. Photo, above, from a pollution hotline report about a dumped scooter in the Bay. Duck hunting clubs in the North Bay are allowing stagnant water to contaminate Suisun Marsh, a rich wildlife habitat and one of the largest marshes on the West Coast. At the end of hunting season, duck clubs flush stagnant water from their hunting ponds into Suisun Marsh and its inlets and sloughs. The discharged water contains high concentrations of bird waste and other organic matter, causing precipitous drops in dissolved oxygen. Fish and other aquatic animals need oxygenated water in order to breathe. Fish kills have been reported in the sloughs of Suisun Marsh following duck club flushes. Privately owned wetlands are also a major contributor of methylmercury—a toxic heavy metal—in the surrounding waters. 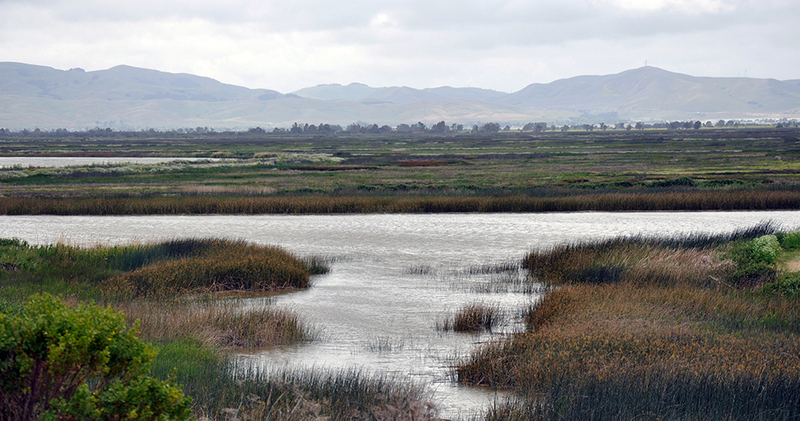 Baykeeper recently advocated for stronger controls and monitoring of oxygen depletion and methylmercury in Suisun Marsh. We'll continue to push for water quality protections for Suisun marshland habitat and all the wildlife that call it home. Learn more about Baykeeper's advocacy to protect Suisun Bay from duck club discharges. The 5th annual Bay Parade was a huge success! 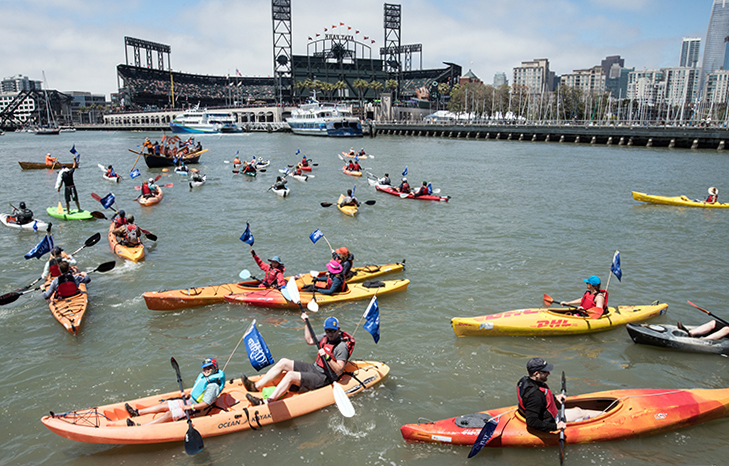 More than 250 swimmers, paddlers, boaters, and volunteers joined Baykeeper to celebrate San Francisco Bay. With your support, the event raised a tremendous $104,000 for Baykeeper's work patrolling and protecting San Francisco Bay. Thank you to everyone who participated, volunteered, fundraised, and donated for the Bay Parade! You can read about the Bay Parade's open water swimmers, paddlers, and colorful festivities in this article from the San Francisco Chronicle. A special thank you to our event sponsors: United Airlines, Levi Strauss & Co., Anchor Brewing, the San Francisco Giants, and Toyota, national presenting sponsor of the SPLASH event series. And congratulations to the 2018 Golden Rivet Award winners! Danielle McPherson, Fastest Solo Swimmer; The Humpbacks: Wendy Kordesch, Kristina Kordesch, Craig Gawlick, Kathleen Sheridan, Fastest Relay Team; and Peter Molnar, Neal Powers & Marc Glomb, Top Fundraisers. View Baykeeper's Facebook album of photos from the event. On a boat patrol near San Francisco, Baykeeper staff noticed a large recycling facility with trash lining the fences near the shoreline—only a wind gust away from releasing Styrofoam packing peanuts and plastic bags into the Bay. Baykeeper is following up to get the facility to contain its trash. During another recent boat patrol, Baykeeper staff documented dilapidated piers disintegrating into the Bay near Islais Creek. Old infrastructure like this often contains paint, asbestos, rust, and other contaminants. The Baykeeper team is working to get the Port of San Francisco to clean up aging structures. And Baykeeper staff aboard the patrol boat spotted a sand miner (below) culling sand from the Bay's floor. Sand depletion causes coastal erosion and habitat loss, and will exacerbate the impact of sea level rise. Baykeeper has been fighting in court since 2012 to stop allowing sand miners to harvest over a million cubic yards of Bay sand every year.